Astilbe sprout large, plume-like flowers and are well-known for their thick, glossy foliage. 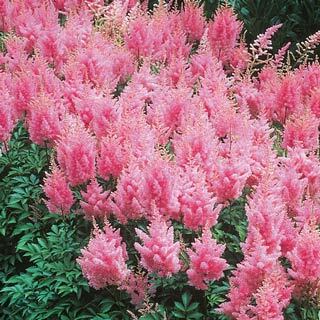 Since astilbe prefer moist soil, they serve as fantastic pond-side plants. Most Popular Colors: Pale pink, bright pink, mauve. Blooming Season: Early to midsummer. Soil Preferences: Astilbe prefers moisture-retentive soil, but won't thrive in soggy conditions. The plant prefers acidic soil, and may yellow if exposed to too much alkalinity. Climate Preferences: Hardy in most temperate climates. Sun Exposure: The plants can tolerate some sun, particularly if they're planted in a boggy region, but will burn if exposed to too much. Landscaping Tips: If you choose to plant astilbe away from your home or another shade-providing structure, plant near taller shrubs or trees. Some varieties grow fairly tall, so consider interspersing shorter shade plants, such as ferns or low-growing hostas, to provide a thicker garden. • No deadheading is required, but the flowers can be cut back after blooming season. • Add organic matter to the soil at least once per planting season. • Be sure to provide plenty of water, but don’t allow the ground to become soggy.